Homology Mouse - identical; human - 16/17 amino acid residues identical. 1-3. Guinea pig Anti-GABA(A) α1 Receptor (extracellular) Antibody (#AGP-083), (1:400). 4-6. Guinea pig Anti-GABA(A) α1 Receptor (extracellular) Antibody, preincubated with the control peptide antigen. Western blot analysis: #106-035-006 (Jackson ImmunoResearch) or #A7289 (SIGMA). Immunohistochemical staining of rat hippocampal dentate gyrus sections using Guinea pig Anti-GABA(A) α1 Receptor (extracellular) Antibody (#AGP-083). 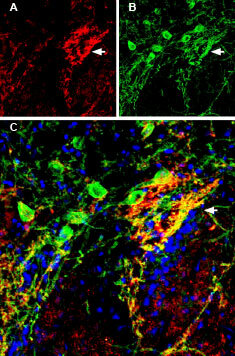 A. GABRA1 staining (red) appears in neuronal soma (horizontal arrows in panel B) and in the neuronal processes (vertical arrows in panel B). B. GABRA1 staining merged with DAPI counterstain (blue). Owens, D.F. and Kriegstein, A.R. (2002) Nat. Rev. Neurosci. 3, 71. Immuno-colocalization of Synapsin-2 and GABA(A) α1 Receptor in rat striatum.Immunohistochemical staining of immersion-fixed, free floating rat brain frozen sections using rabbit Anti-Synapsin II (SYN2) Antibody (#ANR-015), (1:300) and Guinea pig Anti-GABA(A) α1 Receptor (extracellular) Antibody (#AGP-083), (1:600). A. Synapsin-2 staining (red) appears in Islands of Calleja (IC), (arrow). B. GABRA1 (green) is also detected in Islands of Calleja and in adjacent neurons. C. Merge of the two images demonstrates colocalization in IC while adjacent GABRA1 positive neurons do not express Synapsin-2. Cell nuclei are stained with DAPI (blue). Alomone Labs offers a highly specific antibody directed against an extracellular epitope of rat GABA (A) α1 receptor. Guinea pig Anti-GABA(A) α1 Receptor (extracellular) Antibody (#AGP-083) raised in guinea pig can be used in western blot and immunohistochemistry applications. The antibody recognizes an extracellular epitope and is highly suited to detect GABRA1 in live cells. It has been designed to recognize GABRA1 from human, rat and mouse samples. The antigen used to immunize guinea pigs is the same as Anti-GABA(A) α1 Receptor (extracellular) Antibody (#AGA-001) raised in rabbit. Our line of guinea pig antibodies enables more flexibility with our products such as immuno-colocalization studies, immunoprecipitation, etc.